Mintel just published some highlights of a mood of the nation tracking study. 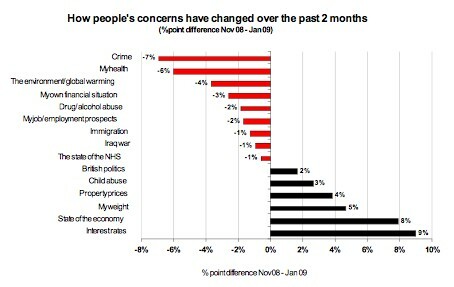 Concern over the economy has hugely spiked in the last year, followed by interest rates, personal financial prospects and property prices. In the same time frame worries about immigration, crime, drugs, child abuse and global warming has been slipping away. 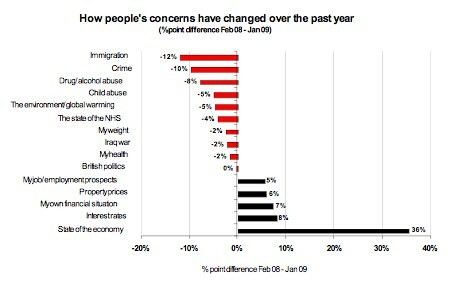 A big shift from more social issues to the very personal impact of the economy. One to watch for the politicians. In the last two months weight has increased as a concern (unsurprisingly), but the emphasis is still on our financial state. My instinct says that we’ve not seen the full extent of behavioral change we will see in 2009, many people who are worried have made some changes in their spending and saving patterns, but there’s plenty more adjustments to come, including downshifting purchases, delaying spending and increasing saving. A big watch out for premium or indulgence brands is to make sure their value proposition keeps track of the mood of their core customer base (ideally by adding value rather than discounting? ).